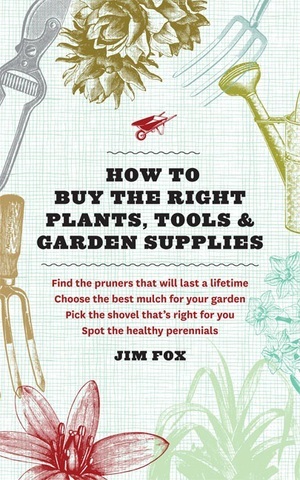 At the WMMGA Upper Valley Symposium book sale in March, I spotted a little book titled How to Buy the Right Plants, Tools & Garden Supplies by Jim Fox and published by Timber Press in 2013. The cover also stated Find the pruners that will last a lifetime; Choose the best mulch for your garden; Pick the shovel that’s right for you; Spot the healthy perennials. Well, we all have purchased many, many different pruners trying to find a better one, been unhappy with our mulch, broken the handle of a shovel or two, and thought we had purchased a healthy Heliopsis only to have it covered in white flies a month later. OK, Jim Fox, enlighten this old gardener. Section 1 is all about What to Know Before You Buy. Knowing your climate zone, moisture levels and soil type, sun and shade, the purpose of your garden, your budget, your abilities and ambitions, and finally, making your plant list. And all before you run to the garden center and let your emotions guide your selections. We all know that, right? But wait, on page 21 Jim writes “The Master Gardener program, cooperative extension service, or national agricultural agency in your area may be able to suggest a lab to do this soil testing.” If he values the Master Gardener program, maybe he does know what he is talking about! Let’s see what he says about tools such as shovels. There is so much more advice and wisdom (notice how I am now a Jim Fox fan) in this tiny book than I could include in this review. The author, Jim Fox, works in the retail nursery business. He offers private horticultural consultations. His years of answering gardener’s questions inspired him to write this book. I’m glad he did! I highly recommend that even the most seasoned gardener purchase and read this little treasure trove of advice. And if you know any one new to gardening, this is a gift that will keep on giving.